Whisk the eggs with the milk and then gradually pour in the flour, whisking continuously until smooth. Cover with cling film and leave to rest in the fridge for at least half an hour. Beat the batter with a whisk before using. Give the pan a jiggle so the entire base is covered with the hot melted butter. Once the butter starts to become almost golden brown in colour add a ladle of the crepe mix and really shake the pan around to spread the mix over the entire base of the pan. When the crepe is browned on the underside use a spatula to flip it over and brown on the other side. Once both sides are browned place the crepes on an upside down plate with a clean tea towel over the top and set-aside until ready to use. Pop half of the butter into a heavy bottomed non-stick pan over a medium heat; once the butter starts to sizzle add the mango, sugar, vanilla pod, orange zest and the Armagnac along with 2 tablespoons of water and cook for 2 minutes. Remove the pan from heat. 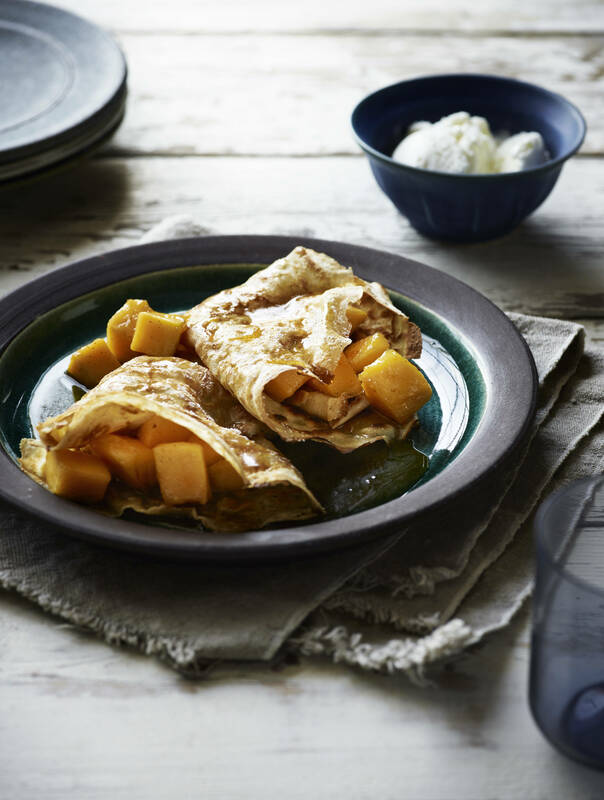 To assemble the dessert lay four cooked crepes out on a clean surface, spoon some of the cooked mango between the four crepes. Fold each crepe in half and then half again, use your hand to flatten the crepe a little. Heat the remaining butter in a large pan over a medium heat and carefully add the crepes browning them in the butter, once golden in colour flip the crepes over and brown the other side, pour any remaining cooking liquor from the mango into the pan with the crepes and spoon the liquor over the crepes. Serve the crepes immediately, drizzling any leftover liquor from the pan over the crepes, dust with icing sugar and serve with a scoop of vanilla bean ice cream.